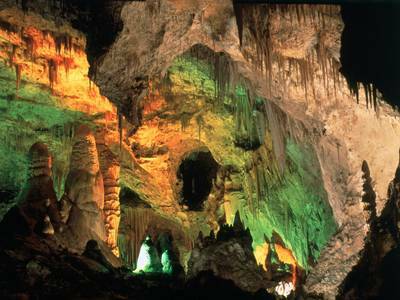 The Jeita Grotto are made up of two connected limestone caves. The lower cave was discovered by Reverend William Thomson in 1836, and can only be accessed by boat. It is possible for visitors to get tours here in rowboat. The upper cave, 60 metres above the lower cave, was discovered in 1958. They can be accessed through a tunnel and have safe walkways where tourists can travel. Together the two caves are almost 9 kilometres long. They are located about 18 kilometres from Beirut. Aside for being a top tourist spot, the Jeita Grotto supply drinking water to more then a million Lebanese.